'The Stories of the Three Wanderers' is an open-ended project meant to unveil various perspectives of relationships we build with each-other, through or with objects that surround us. It is constructed to be a travel log of three jewelry pieces, that will wander the world for 1 year, from host to host, and collect experiences, stories and adventures. Regardless of our awareness, all things we interact with come with a previously embedded emotion or story, that affects our relationship with it. This log will aim to explore all of these connections: maker – wearer, past wearer – present wearer, object – person. The work itself is the journey of the pieces, changing context and environments, reflecting on host's personality, behaviors, routines. All of the experiences (documented with writings, photographs or videos that hosts will share) from each 'visit' will be collected and regularly published online as a digital diary, presenting how each host adds value and meaning to these little works of art. A unique piece of jewelry, a brooch from stainless steel crochet, brass and bronze. It was made in 2013 for my final MFA thesis collection The Sensibles. 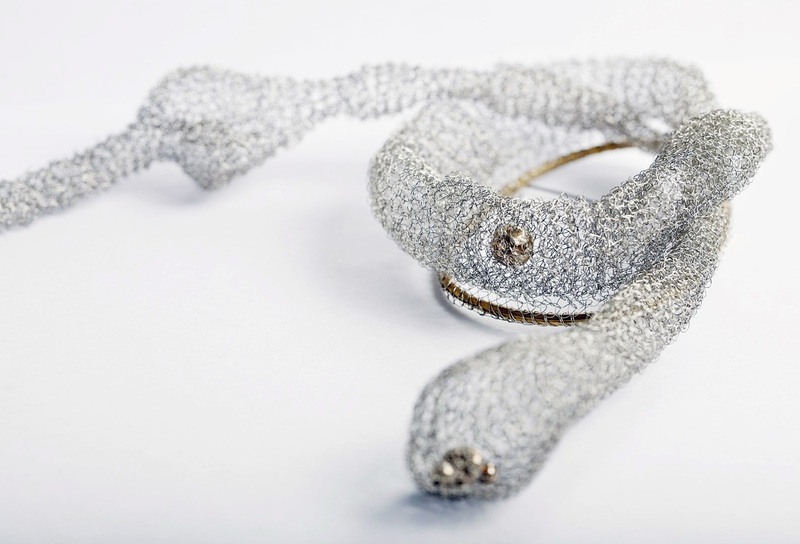 The brooch is part of a larger collection of works, all made with the same intention of triggering and inviting our touch in order to stimulate our imagination of feeling beauty on a different level.The concept behind this was to accent the plurality of tactile sensations, while presenting this (tactile) sense as a potent source of beauty. Three colored necklaces tangled into one. It is a very simple type of chain, but also an elegant look due to its minimal design. The colors are brown, pink and orange. Most probably the material they're made out of is plastic, but cannot be sure because they came without a box or a label... each for the price of $1.45 in a local store. This one is a factory made piece, most likely made in very large quantity. 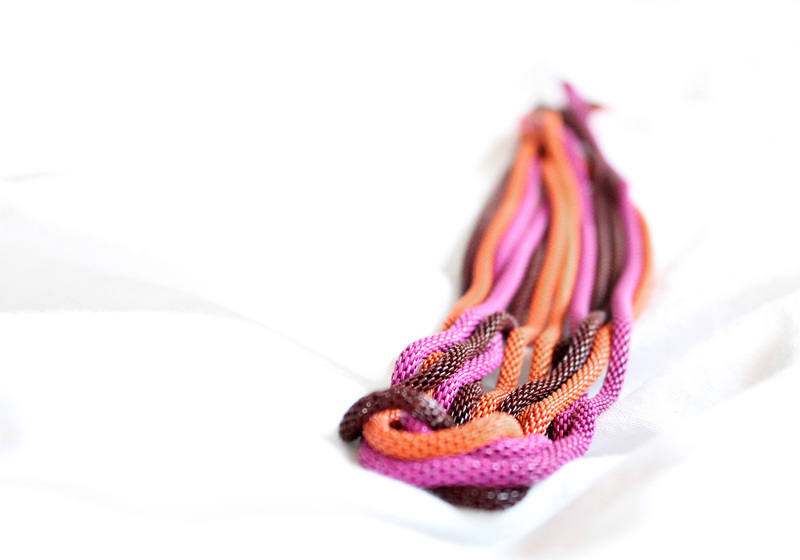 It can be worn as a necklace or a bracelet if wrapped around the wrist a couple of times. 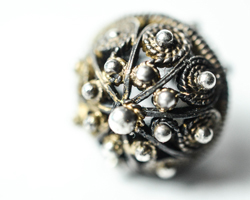 A beautiful antique piece of jewelry, made in filigree technique, in a form famous under the name - The Galichnik button (after a Macedonian village it comes from). This particular piece is an heirloom and was given to me by my grandmother before she passed away. It dates back to around the 1800 when it was used as a button on traditional wedding clothes at that time. Still it is one of the most recognizable forms for the filigree technique here in the Balkan, famous for its complexity and beauty. When this technique was still traditionally passed on from generation to another, the apprentice was considered to have mastered the craft when he was able to do the Galichnik button. Today filigree is still practiced in the Balkans and Macedonia, even though until recently it was considered to be a dying craft. * Unfortunately this Wanderer got lost during his journey somewhere while in Tampa, Florida. 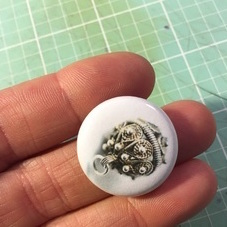 We are coninuing that story with the same pasion and energy, but instead of the Filigree Sphere, the travelers are 20 brooches with the 'face' of Antique traveling in his honor.